WiseWays Herbals was founded over 20 years ago by Mariam Massaro, an herbalist and organic gardener. Inspired by a vision, Mariam created her original line up of herbal products using organic or wild-crafted herbs to restore the connection between nature, body and soul. 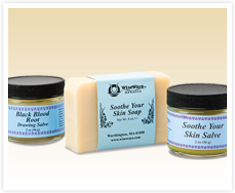 These highly regarded products are still hand crafted to promote well-being, and are now distributed worldwide.